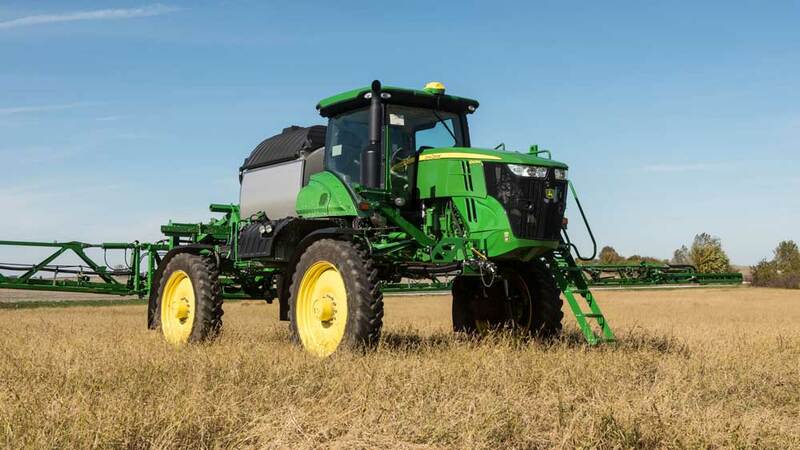 According to Doug Felter, product marketing manager for John Deere application equipment, today's producers and service providers are demanding sprayers that can do more throughout the season, cover more acres per day, and make more accurate applications under often tough conditions. "Oftentimes, application windows are very narrow, so having a sprayer that can quickly handle the jobs with less crop damage or impact on the soil is a big advantage," Felter explains. "The addition of the R4044 to the 4-Series family fills that need perfectly." The ExactApply nozzle control system is another popular technology that improves sprayer performance. It allows the sprayer to maintain consistent droplet size and pattern through a wide range of speeds, while reducing the potential for overlaps, skips and drift. Another major benefit of ExactApply is that operators have full turn compensation and shut-off functionality at the nozzle level (every 15-20 inches (38.1-50.8 cm), which can help reduce input costs by 2 to 5 percent. "The R4044 is one of the most accurate and productive sprayers in the 1,200-gal. (4542 L) capacity category and is perfect for customers making multiple field applications and want to minimize crop and soil impact," says Felter. "And with the CommandView™ III cab, it offers advantages in operator comfort, visibility, ride quality and common control layout like our other 4-Series Sprayers."